Thursday was a miscellaneous day where I tried to play catch up, or make any final trips before I head back tomorrow. With there being no concrete plans, I ended up leaving my hotel room with an Uber at about 12:30. The first stop was to see Temple Church, one of the Da Vinci Code’s literary, and on-screen, locations. Off of Fleet Street, its architecture fits the essence of its patrons, the Templars. I’d like to think of its design as Crusader mold. With its circular symmetry, elongated hall, tall pillars, and early-Goth ceilings, Temple Church definitely made its mark as you entered its rod iron gates and heavy arched door. The 12th-century effigies of lord-knights and moldings of kings’ sacrosanct statues were pieces of history literally ingrained in carved stone. Additionally, decorated in red and gold, a glorious pipe organ, to echo hymns above patrons and church-goers. A steep-spiral, stone staircase led to a second floor where its semi-circular design was full of multi-colored tiles imprinted with lambs, knights on horseback, lions, and winged horses. However, I must say that it may be secondary compared to the Rosslyn Chapel. Though I can’t say that based on experience, as I’ve yet to see it when I was last in Scotland. After some quick snapshots along its courtyard, I walked over to the Charles Dickens Museum on the corner of Doughty Street. For nine pounds and another six for a self-guidebook (as photography isn’t allowed), I ventured into the five-story home of one of the world’s most beloved writers in all literature. Above his doorstep is a blue plaque with his name, his mortality, and literally states, “Novelist lived here”. I explored the first home he resided in for almost three years. It was the place he finished The Pickwick Papers and Oliver Twist, wrote Nicholas Nickleby, and began a more lavish upbringing with his wife, Catherine, and the first of ten children they’d have together. His study was the ultimate writing space logistically and ascetically. But you’d be surprised that for a writer and avid reader, Dickens grew up in a lower, middle-class family which meant accessibility to books was limited. Even as he climbed the social and economic hierarchies, he maintained his ever-growing wealth for his family. His extensive book collection was acquired merely through gifts and the first editions of his works; mostly it contained nothing more than “three-piece novels and books of travels,” said author, George Henry Lewes. Nevertheless, its translucent display was spectacular; so much so that it amplified the centerpiece of the study: Charles Dickens’ writing desk. Unfortunately, as I stated before, photography wasn’t allowed so I got a postcard of an infamous drawing by Luke Fildes, illustrator to Dickens’ unfinished novel The Mystery of Edwin Drood. 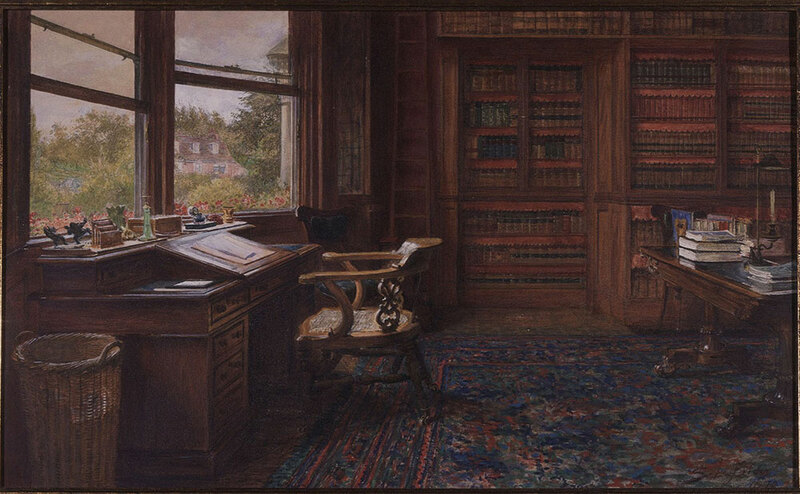 It’s a depiction of the author’s study (his desk and chair as the focal point) at his residence in Gad’s Hill Place shortly after his passing in 1870 (Above). This was a doorstep that led to lots of entertainment and socialization. Dickens was an adamant extrovert. People were his inspiration. After dedicated yet tedious hours of writing, he’d go out on the hustle and bustle of the Bloomsbury area. He’d take extended walks observing, and absorbing the energy of, his fellow man. The spirit of the people conjured his brilliant yet relatable ideas for the stories we still keep on our shelves today. Meanwhile, this Regency home was the perfect convenience for him to see his publishers, go to the theatre, and resided within the familiar routes to his regular spots for leisure. One interesting fact I had to say was that in the museum, on the top floor in the servant’s quarters, was a stuffed raven on display. As it turned out, Mr. Dickens had a pet raven named Grip. And even made an appearance in one of his subdued stories, Barnaby Rudge. But the stuffed raven here isn’t his; professionally taxidermied and mounted, the real Grip is on display in the Philadelphia Free Library within the Rare Books department. Once I had my fill of creator to Scrooge, Pip, and countless other characters, I purchased notable souvenirs and made my way to the cafe. It’s part of the home’s extension and bypass into his garden. Naturally, I ordered a comforting pot of tea with a cheddar and bacon quiche. While I waited, I went around the brief corner to find the most amazing chair perfectly designed for any English major: high wingback, red, leather-worn, soft as butter, and upholstery that molded into your body like a deep hug. I sat there for an hour gladly in spite of the occasional patron glancing over with slight envy. As the afternoon turned into late, I gathered my bearings for a brisk walk to the British Library. For the sake that it’s a nationally acclaimed (even internationally) sanctum of knowledge, discovery, and history, and deemed an exciting field trip for English majors and writers alike. However, since I did arrive later than anticipated, its latest expedition was closing up in an hour; and the entire display of Saxon gallery would take at least twice as long to go through. Meanwhile, you have to be a member or make an appointment to see specific collections of rare works within the library. But I managed a passing wave to Shakespeare by the stairs, then headed to the multitude of books several stories high labeled the King’s Library. After a brief appraisal of all things accessible on the complimentary map, I came across their rare books and documents gallery available to the public. For those of you who have yet to take a look in there, you will spend a good forty-five minutes viewing heavy, age-old books of all regions, illustrations, frayed sheet music, hand-written accounts of authors and scholars, superbly preserved religious works (Bible, Torah, Qur’an, etc. ), and so much more. The texts and written works that caught my attention, and kept it, were quite partial to me: a 14th-century illustrated, yet very graphic, Sir Gawain and the Green Knight; an early edition of Christopher Marlowe‘s work from the late 16th century (a fellow bard and considered the predecessor to Shakespeare on the London stage); a portable writing desk belonging to Jane Austen with a handwritten letter addressed to her brother displayed on top; a journal of Charlotte Bronte’s early writings she brainstormed at just 19 years old; AND most importantly, to me, a 13th (or 14th) century account of supposed story of King Arthur on a journey with remanents of Christ’s cross. I felt a supreme sense of confirmation when I saw this leather-bound, well-preserved, rather colorfully adorned text. Even though I wasn’t meant to go to Cadbury–to explore for Arthur–it was wonderful to be reminded of my current purpose as a writer; a sign that stated I’ve all the time in the world and Arthur will always be there. Whether in England or on my bookshelf in my New England apartment. How exaggeratingly sentimental, I know. A black blanket of night cast over the vibrating streets in mid-London. So that was my cue to get takeaway and grab a ride back to the hotel. Nothing really stuck out for a place to sit for dinner (and my phone was dying), so I headed into a nearby Tesco, got some pasta, cheddar and red onion crisps, and sparkling water for dinner. Then my uber arrived on a buzzing street. After picking me up ten minutes later, I ended up being in an hour ride due to unsuspecting yet obscene traffic. Tonight, I relaxed as I somehow reorganized my suitcase with laundry, souvenirs, and my stamp high tops. Thank you, London. You’ve certainly opened my eyes about the solo experience on your streets and by the River. I will see you again and, if God-willing, become a squatter nearby. 1. Double-check open hours and side attractions, otherwise you’ll miss fascinating exhibitions like today. I love learning about early British roots especially when a chunk of the history involves Britons, Celts, and Saxons. 2. If photography is prohibited, find the images you can’t screenshot, within postcards, prints, and other forms. Souvenirs are beautiful yet severely overlooked links to experiences. I wish I had looked over the postcards again for any of the rare books’ images from the open-access gallery. Every adventure is a chance to live the way you dream. We’re two writers who took on the Emerald Isle and Caledonia. Almost a year later, we marched the cobblestone pavements of Boston and Salem. The Voyagers assure you every little tidbit is on here! It’s just that there’s still a bit of a tech learning curve. And Katie just returned from England! Check out her day-to-day escapades. Day Three & Four of Voyager Katie is up to browse! Link in bio! #londoneye #westminster #harrods #brompton #octoberadventures #onceandfuturevoyager AND today she headed to Hartford to see Twain’s not-so-humble abode 🤓✍🏻📸 keep an eye out for that! As writers, we are also readers. Readers of everything we can get our hands on. From historical fiction to creative non-fiction, we find inhalation at every turn. After graduating from The Ohio State University, all with a B.A. in English & Creative Writing, we were looking for our next great escapade. With our wanderlust natures, it’s instinctive that all our readings instill a strong desire to visit some of the places we touched only in our reader minds. And thus, our little blog of documenting adventures has been born! Join us on our next big adventure as we drift towards uncharted territory later this year!